Data loggers (sometimes called probeware) are hands-on technology tools that can support interactive learning in science, health and PE, social studies, technology and mathematics. One of the goals of the Pacific Science for Health Literacy Project (PSHLP) was to enable access to technologies in support of hands-on learning. 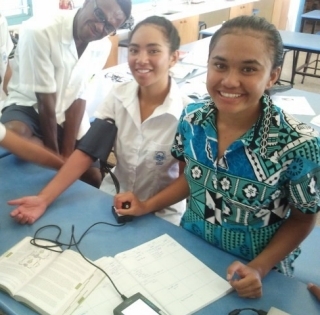 Through the New Zealand Aid Partnerships Grant the PSHLP teams in the Cook Islands and Tonga were able to purchase class sets of data loggers and physiology probes to support hands-on learning associated with exploration of health and wellbeing in schools. Data loggers enable the use of technology tools to collect, analyse and visualise data. Data loggers have been shown to improve learning in science classrooms internationally. PSHLP teachers reported that the use of data loggers increased student engagement in learning and supported the development of concept understanding. 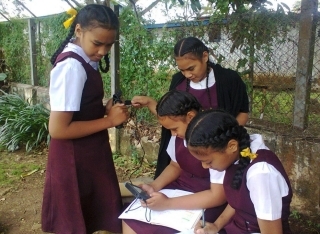 Vernier LabQuest 2 was selected as a product that would be usable in classrooms in the the Pacific Islands where many schools have very limited access to computers and the internet. LabQuest 2 is a standalone data logger so could be used in schools that had no student computers, and in some cases, some classrooms without wall power sockets, and could be used outside of the classroom. When computers are used in conjunction with the loggers, the software used in the project is Logger Pro or Logger Lite. Because the focus of PSHLP is on exploring health and wellbeing, the probes made available to schools were from the Vernier Physiology Package. "The provision of data logging equipment to the Cook Islands Ministry of Education has provided opportunities for students on Rarotonga to actively engage in hands-on learning, data collection and data analysis within a health context. Experiments such as measuring heart rate at different activity levels really brings health science alive for the students. They see real-time data graphs and can understand the effect of physical activity changes on the heart." "Students really love the grip strength experiment, trying to outdo each other, while learning about muscle strength and fatigue over time." "We have used the data loggers for practical classes exploring surface temperature, grip strength, heart rate, blood pressure and ECGs." "The data loggers have been used in the Year 11 diabetes module, allowing students to measure heart rate before, during and after exercise." "We have also used the data loggers in classes besides those in the project. For example in the Level 3 (Year 13) Biology course students used data loggers to measure blood pressure within a learning module exploring concepts of homeostasis." "The students are excited by the experience of seeing, feeling and touching the data loggers, as well as actually taking measurements!" "The students were so focused in these lessons that the bell would ring and they would just keep working. They did not want to leave." "For us we know what getting students talking about their learning is important. In these lessons the discussions came easily. Students wanted to talk about their learning." "Becasue it was hands-on that was new for our students. I think that is why the understanding was so good." Professional Learning and Development (PLD) opportunities for teachers are essential. During the project teachers have had a range of opportunities to learn about data loggers and experiment with them before they take them into their classrooms. As in most schools, teachers change from time to time, so it is important that teachers share and pass on their knowledge and experience of using data loggers as a tool to support learning. PSHLP lead teachers from Tonga High School are happy to support other schools to learn about and use the data loggers.